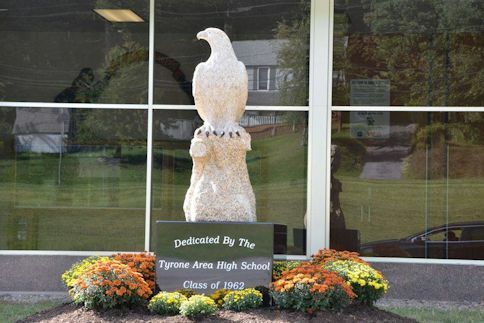 The front of entrance of the Tyrone Area High School and the statue donated by the Class of 1962. The one room log schoolhouse that once stood in Tyrone is long gone, replaced by a modern new preK-12 campus on Clay Avenue. From very humble beginnings, the Tyrone Area School District has a long and interesting history. Today, Tyrone Area School District is one of the highest achieving districts in the area, routinely exceeding academic expectations, and even winning a National Blue Ribbon Award for the high school in 2015. It all began in 1852, two years after Jacob Burley founded what would later become Tyrone. A log schoolhouse was constructed in Tyrone with J. M. Calderwood as the first schoolmaster. Within the same year, the school’s population outgrew the schoolhouse, and a new one had to be built. The new school was a two-story white brick building on the corner of 12th Street and Washington Avenue. The first floor held the school and the second floor was rented out to Methodist Church for their first congregation in Tyrone. In 1868 a new brick schoolhouse was built at Logan Avenue and 14th Street. By 1895, that school had a total of 19 rooms. In the same year that the Logan Avenue building was constructed, the borough of East Tyrone also built its first school house. It was an eight-room building located on the corner of Adams Avenue and 17th Street. Another schoolhouse was built in the meantime at Brewery Hill, although it was soon abandoned. In 1895 the population of Tyrone was large enough to allow the school district to break from county control and become an independent district. The school’s population at the time was estimated at 1300 and it had three buildings. It was regarded as both modern and adequate. The schools also boasted a 500 book library. Nineteen teachers and four instructors made up the faculty of the high school. The classrooms were likely dreary and cheerless due to the stark philosophy of work and discipline that was popular at the time. For over fifty years there was no attempt to change this cheerless atmosphere, not even for the little ones entering school for the first time. It was not surprising that recess was a welcome part of each school day nor that many entered the workforce as soon as possible. A high school was planned in 1910, and by 1911 it was able to accept students despite the fact that it was still under construction. The high school on Lincoln Avenue in Tyrone. Tyrone’s first high school principal was Norman C. Koontz, a man who went to Yale. He remained in Tyrone for only one year. A trend quickly developed among the principals, as they were replaced in rapid succession: W. W. Raker, 1914-1917; H. B. Weaver, 1917-1918; Joseph Miley, 1918-1920; J. Kimber, 1920-1922; W. R. Bell, 1922-1925; R. R. Abernethy, 1925-1927; John Bowser, 1927-1929; F. Clark Skelly, 1929-1945. In 1914, J. L. Gaunt was elected as the Superintendent of Schools. During Gaunt’s tenure, German and French were added to the curriculum. Gaunt also began holding inter-school debates with Huntingdon High School in 1913, thus confirming the often cited legend that the speech and debate team are the “oldest sports” at Tyrone High School, predating the football program by nine years. These debates continued until World War I. One of the earliest known editions of the Spokesman. the forefather of today’s Eagle Eye. After WWI, the school magazine was changed to a newspaper. The forerunner to today’s prom also got its start in the 1910s. The Junior Reception, as it was called, was not held in school because dancing was frowned upon by the administration, according to Ralph Wolfgang, a former Tyrone teacher who wrote an early history of the school in 1978. Students at the time could also participate in the Junior Oratorical Contest. Participants would give a speech and students would vote on their favorites. The winners received cash prizes. First place was awarded $10, second place receieved $7.50, third place was $5, and all other participants received $2.50. 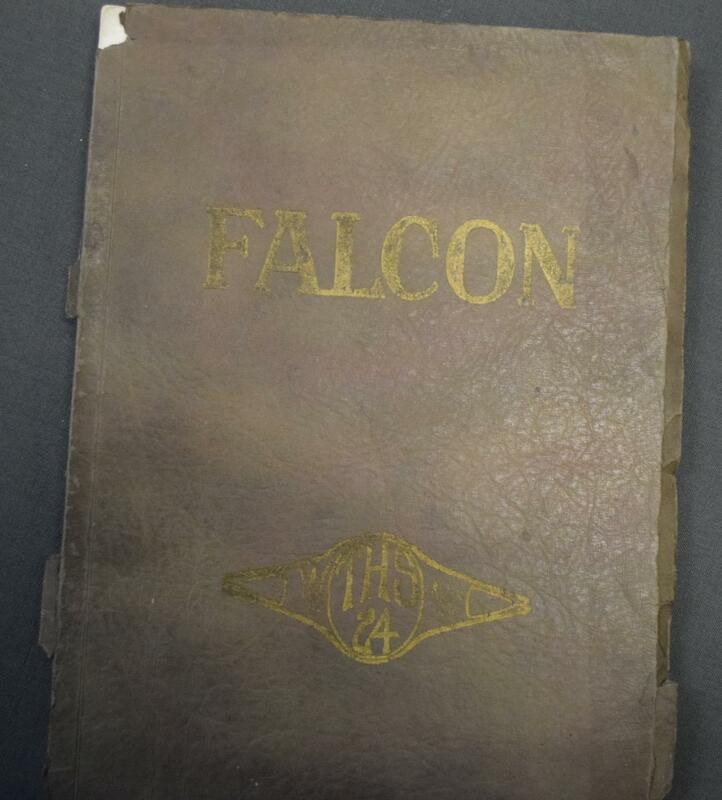 In 1917 also saw the publication of Tyrone’s first yearbook, “The Falcon.” Publication was suspended after only one year, presumably due to World War I, and resumed in 1921. Scaned copies of the yearbook can be found here. In the fall of 1918, a great epidemic of influenza swept the country and affected every public institution, including Tyrone High School. The schools, and most other public places, shut down to prevent the spread of influenza. The shutdown began on September 27, 1918 and continued through November 11th. Also, on the morning of November 11th, whistles also sounded off to mark the end of World War I. Locals recall that the whistles left no chance to oversleep. According to Wolfgang’s History, the children returned to school with a holiday mood and there was more celebration than learning that day. One of the first instances of technology being introduced to the school was a radio that was purchased for the science room 1922. Students could pay for the privilege or listing to the radio by purchasing a share of the radio at a cost 25 cents. According to a booklet of the history of the school published in 1978, the first Tyrone football team was formed in 1922: by 1924 it tied with Altoona, and in 1925 beat Altoona for the first time. The team used the Athletic Park until 1933 when the school bought its own field behind Adams School. The 1924 yearbook, then known as the Falcon. On January 6th, 1930, the bells rang at the wrong time, all but three seniors were late. 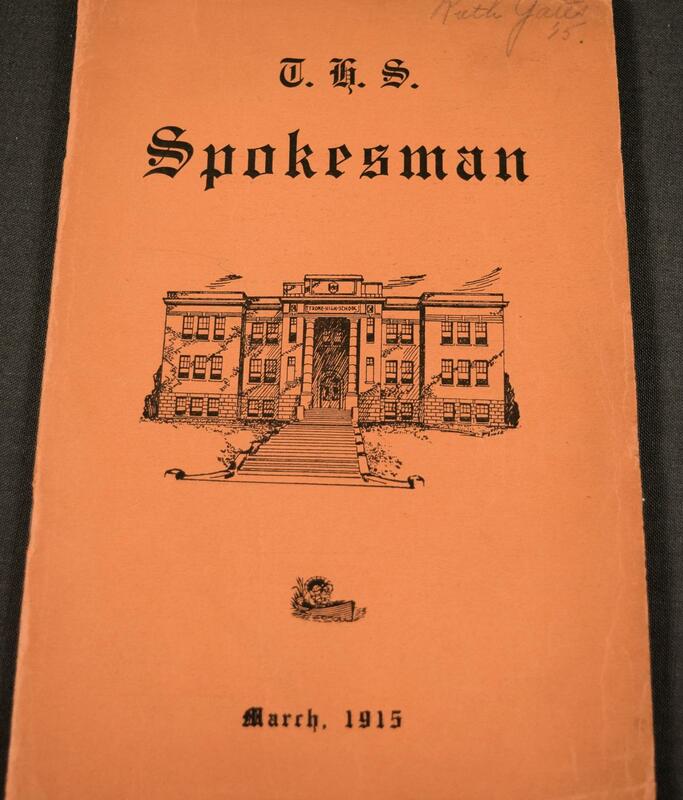 In March of 1930, seven delegates representing the Spokesman went to New York City to attend the Columbia Scholastic Press Association Convention. Additionally, the first mention of the Tyrone football team being referred to as the “Golden Eagles” appeared in the 1933 Falcon Yearbook. In October of 1934, the Junior Red Cross sold almost 15,000 tons of peanuts at the YMCA. Several Tyrone students were sent to Chicago in May 1936 to represent the Tyrone chapter of the Junior Red Cross. When the United States entered World War II in 1942 many seniors, and even some underclassmen, enlisted in the armed forces and left for war. Tyrone even started preparing for air raids, as mentioned in the Spokesman. 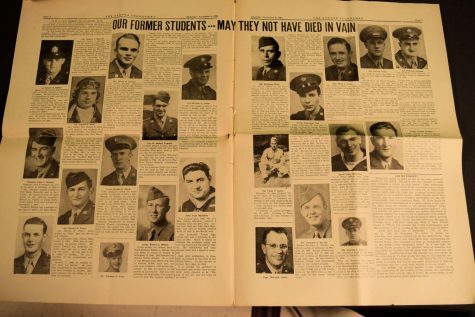 In November 1945, the Spokesman ran a full two page spread in honor of recent Tyrone graduates who were killed in action. In 1944, kindergarten was introduced in the elementary for the first time. In August of 1946, the vocational department purchased $30,000 worth of equipment for the various classes. In 1949 a new newspaper called ‘The Sophomorean’ was also printed by the students at Tyrone High School. Only one issue has been found. In 1959 Dr. Norman Miller, superintendent, raised $35,000 for an indoor pool. Mr. John Meyers gave $1,000 on the condition that he could throw the superintendent into the pool. 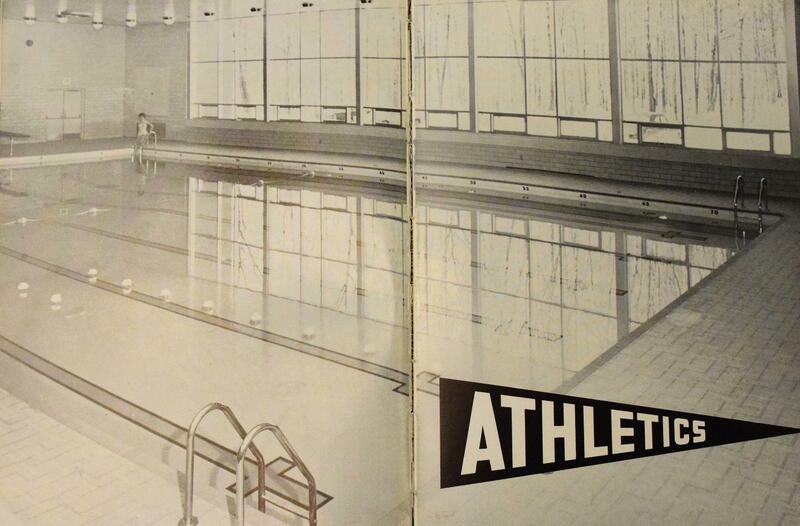 The pool was constructed and the superintendent kept his word and was thrown in the pool. The current Tyrone High School was completed in the 1960s and the old one was closed. World War 2 Memorial in the 1945 Spokesman. 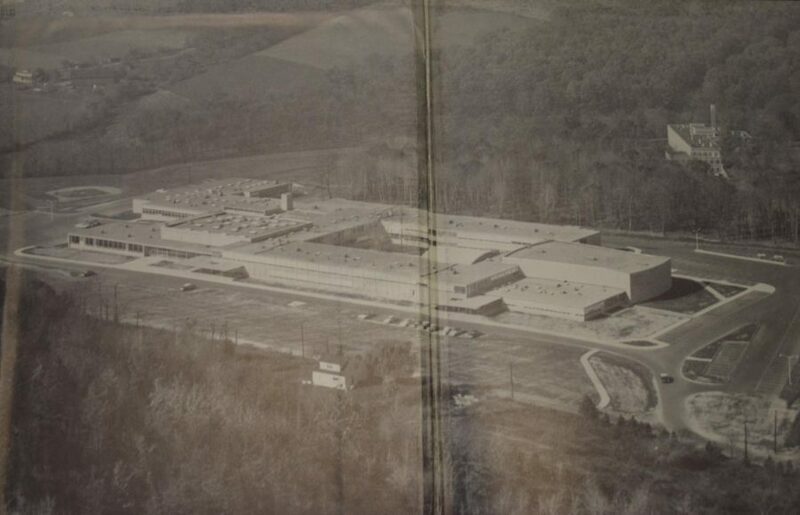 A picture of the 1963 high school. 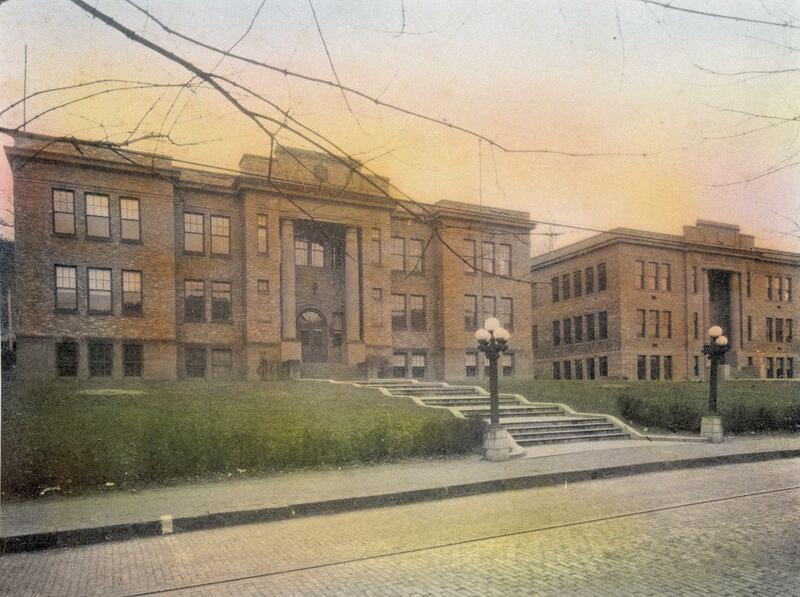 After the construction of the current high school in 1962, the buildings in the district remained mostly unchanged until the 1990s. It was then that the district underwent its biggest changes in its more than 100 year history: the consolidation of local elementary schools into one building in the late 1990s, and the construction of a new middle school addition to the high school building in 2006. All of the local elementary schools, Adams, Lincoln, Logan and Warriors Mark schools were closed by 1999 as the district consolidated into one campus on Clay Avenue in Snyder Township. “When I was a student there were four elementary buildings in the Tyrone School District,” said current high school biology teacher Beth Cannistraci. 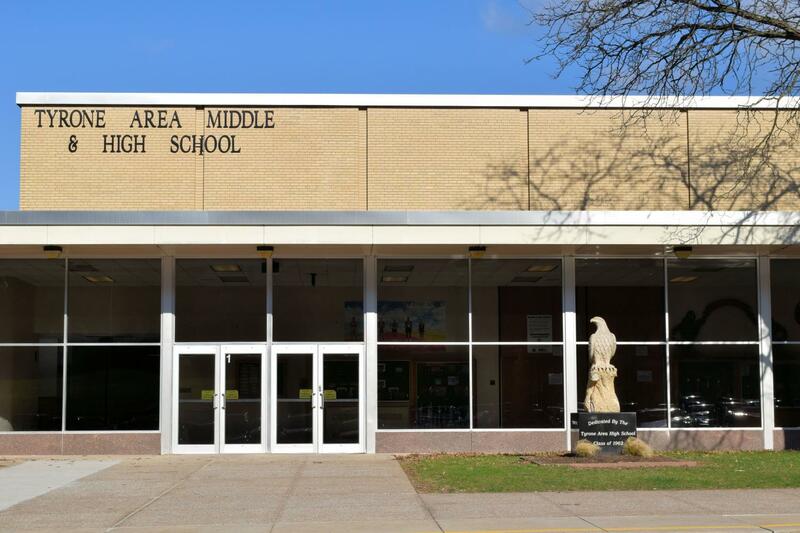 “We did not have a middle school back then. Students went to their local elementary school through sixth grade, and then they came to the high school building for both junior and senior high school. The entire vocational wing was strictly vocational classes. Some of the additional shops offered back then were drafting, electronics, auto, food service, and woodworking,” said Cannistraci. The merging of the elementary schools came mixed opinions. While it definitely made the district more unified and cost efficient, some residents missed having neighborhood schools. Ground was broken for the current elementary school in May 1997. The total cost of construction was $5,865,900. The building originally held kindergarten through fifth grade. “The educational and economic advantages of a one complex educational plant are monumental,” said Superintendent William Miller at the Elementary dedication ceremony on August 29, 1999. The last of the current Tyrone schools to be opened was the middle school in 2006. With the expansion of the middle school, the fifth grade moved from the elementary building. The current middle school now holds grades 5-8. Dr. John F. Vendetti was the first principal in the new middle school and was instrumental in helping to transition the four old elementary schools into one new one. In 2014, the Tyrone High School Class of 1962, the first class to graduate from the current high school building, Dedicated the Golden Eagle statue in front of the school. A picture of the Eagle in front of the school. As the years went by and technology became more advanced, the students also changed as well. Many current teachers can still recall the lack of technology in the classroom until recently. “When I was in school, no one owned a computer,” said biology teacher Susan Cannistraci, who has been at the school for nearly 25 years. 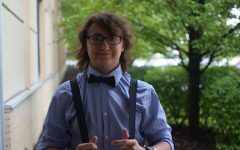 “The only time I had access to a computer was in my high school computer programming classes. I remember early in my teaching career, when teachers were given a desktop computer for the classroom. Soon afterward, teachers were told that they had to check their email at least once a day, which stressed some teachers out. They were not used to the ‘new’ technology and did not know how to send, or what to do to receive emails. Now students have constant access to a computer whether it is with their Chromebook, smartphone or smartwatch,” said Cannistraci. The addition of new technology and computers has revolutionized classrooms and teachers’ lessons. But, according to Stoner, the introduction of technology hasn’t been all positive. “The biggest loss, in my opinion, is the opportunity to read a story from cover to cover in a book you hold in your hands. There is a deep connection we make with that character’s life when we are able to just block out everything else, use our imagination, and absorb the story with each turning of the page. Technology is often loud and bright and shows us how things are to look and sound instead of us creating that image on our own,” said Stoner. Technology has changed how students research and complete classwork, as well. Cellphones have also changed the classroom and shaped new rules. Technology has had some unexpected side effects on the behavior of the student body as a whole. Student involvement in clubs, activities and sports have also evolved. Student’s have changed as well, for both the better and worse, according to some veteran teachers. However, students today have many redeeming qualities, too. “The student body is [in general] more respectful and kinder to each other and the staff than when I started,” said Everhart. The work ethic of students and how they work has also changed. “[In the past] there was a prevalent attitude among boys that it was uncool to get any grade higher than a C,” said Burket. Not only has student behavior evolved, but sense of style and clothing has evolved as well. Although times and trends have changed, Stoner says that students still enjoy getting to break out of the classroom when possible. “One thing that hasn’t changed about students is that most would rather get up and do something as opposed to just sitting in the seat. Sometimes we all just have to sit and get information, but that need to move is why I still love to include projects, plays and other active choices. At Warriors Mark in the winter, the kids would bring their snow clothes and we would all go sled riding after lunch, including me. I think that is something today’s students and many teachers would still love to do,” said Stoner. The school had to change to keep up with the ever-evolving student body. The attitudes of the teachers and school leaders, as well as the atmosphere in the school, have reflected such changes. Student health has also become a major priority in the school. Bryan also said there used to be windows in the bathroom facing the courtyard. He also claims you can still smell the smoke 30 years later. There was also a time not that long ago that it would not have been unusual to see students having firearms on school property. “The kids sometimes brought in their guns to work on them, like they would bring in the stock into the woodshop to sand it,” explained Bryan. Prior to the closing of the elementary schools to move to the new elementary school on Clay Ave. there was also a Grazierville, Washington, and Oak Ridge Elementary School.I attended Grazierville and the school did not have a cafeteria for many years. I can remember being bussed to Logan School for Special Activities. Good job Haydn Loudenslager! As a member of the Class of 1962 and a former Spokesman Feature Editor, I feel your hard work and research came up with a wonderful article that produced a lot of nostalgia and modern information for us “oldies”. It helps preserve for future generations what it was like “back in the day”, regardless of when that day was and those who have traveled these roads before future generations will not be forgotten. One correction with regard to computer use in the classroom. In the mid 80’s the business department had a classroom full of personal computers. They were Commodore Pets used for the early spreadsheet program Lotus 1-2-3 and word processing. They were cutting edge in the business world at the time. No mention of St Matthews School, it still operates as a elementary school in the Tyrone area. It now teaches kids of any faith through 6th grade. When I attended there were 8 grades being taught by the Sisters of Mercy, who had no mercy on you if you were disobedient. Teachers in all schools were permitted to use a paddle to discipline students. This rule should be reinstated. No one thought they were abused if they deserved ” the paddle” . I never heard of any body being hurt, just embarrassed. They also thought twice about doing it again. Never heard a student use the F-Bomb in class. It was taboo, not a common form of speech. Sports were considered a part of education. Both male and females participated in team activities. All teams had enough players, not like today in the age of electronics that warp many minds.Sad. I was a graduate of the class of 1962 and think it was the best class to graduate from TAHS. Our classmates still try do everything we can do for school. Scholarships, scoreboards in the gym, the Eagle in front of the school. Our average age is 74., and we still love TAHS. We would love to see all classes do things that will benefit TAHS.